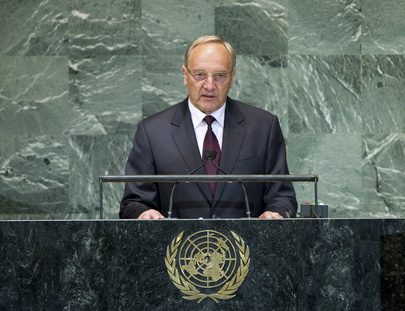 ANDRIS BĒRZIŅŠ, President of Latvia, said the theme of the debate was very timely. The United Nations played a leading role in the peaceful settlement of disputes and had the legal and institutional framework for it. But, such settlement primarily depended on the determination of national and international leaders. The United Nations could come to a decision and act only through that determination and there were currently two concrete challenges that needed that strong will. First, the conflict in Syria threatened security and stability in the whole region and beyond and the Security Council must find the political will to unite and solve that crisis, saying innocent lives had to be protected. Also, the risk of the proliferation of weapons of mass destruction was another of the most serious global threats, and the international community must unite in its commitment to prevent it. On a related issue, he was also concerned about the potential use of stockpiles of Syria’s chemical weapons. He deplored the lack of progress in dialogue with Iran on the nature of its nuclear programme. He believed that Iran’s full cooperation to clarify all outstanding questions was needed. In that regard, he called for the strengthening of efforts to reach the goals of the Nuclear Non-Proliferation Treaty and its Action Plan, while applauding the steps taken by United States and Russia towards global disarmament and transparency. Further, Latvia also welcomed the consensus outcome of the Second Review Conference on Small Arms and Light Weapons and urged a redoubling of efforts to finding solutions on the Arms Trade Treaty in the near future. He welcomed the increasingly active role of regional organizations such as the African Union and the League of Arab States in the peaceful settlement of conflicts, as well as the fact that European regional organizations too had been actively working towards resolution of protracted conflicts in Europe. While he saw positive trends in the direction of political settlement in Transdniestria, Moldova, however, only with progress on foreign troop withdrawal would any settlement be sustainable. In that regard, a multinational peacekeeping mission with an international mandate could be a rational way forward. He observed that the consequences of the conflict in Georgia in 2008 would have a long-lasting effect on the security situation in the region; and Latvia remained concerned over the increasing number of incidents at the contact line in Nagorno-Karabakh. Noting that Afghanistan had been at the centre of world attention for much more than a decade, he said the future of that country was closely tied to economic development and regional cooperation, and encouraged full engagement of the Central Asian countries in discussions on the region’s future. He believed Afghanistan had the potential to become a regional hub for transportation and transit. He said the global economic and financial crisis had focused leaders’ attention on immediate measures to overcome it, often diverting attention from long-term global challenges. The world economy still remained fragile even if some positive trends could be observed. Therefore, Latvia welcomed all efforts to stabilize the situation in the eurozone and supported recent steps to ensure it. He added that his country was working hard to be part of the solution, and a net-contributor to global economic stability. International peace and security was closely linked to development and human rights, he said. Thus, he welcomed the establishment of a High-Level Panel on the Post-2015 Development Agenda. Also, Latvia fully supported the work of a strong and effective United Nations Human Rights Council and had, in that regard, put forward its candidacy for the elections to the Council in 2014. He stated that in order to keep pace with the modern world, the United Nations needed to change, explaining that the time had come to start what he termed “real negotiations” on the reform of the Security Council. Latvia was supportive of the enlargement of the Council’s membership in both permanent and non-permanent categories. Any such enlargement of the Council had to include at least one new non-permanent seat for the Eastern European Group, he added.